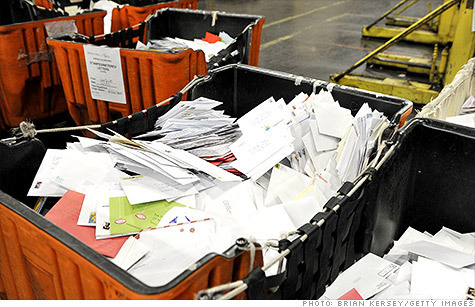 The Postal Service could run out of cash in October. WASHINGTON (CNNMoney) -- Without help from Congress, the Postal Service will not only default on payments for retiree health care benefits, but it could lack cash for operations by mid-October. As of midnight Wednesday, the Postal Service was in default -- for the first time in its history -- on a $5.5 billion payment owed the federal government to prepay health care benefits for retirees. While the Postal Service is in big financial trouble due to fewer people sending mail and the mandate to prepay retiree benefits, the default is largely symbolic. The agency will skip that payment and another $5.6 billion payment due Sept. 30, while continuing to pay employees and contractors to deliver the mail on time. However, by Oct. 15, the agency's cash crunch could result in a $100 million shortfall, according to David C. Williams, the service's inspector general. "We concur with the Postal Service's projections that it might not have sufficient cash to fund its operations in October 2012 and at other times during Fiscal Year 2013," Williams wrote in a July 25 memo. The timing is significant, because experts don't expect Congress to make much headway on saving the Postal Service until after the November election. While the Senate passed a bill in April, the House has yet to take up its version. If the Postal Service runs out of money in October, it may be brief, according to the service and the inspector general's office. The service is expecting an uptick in mail volume and revenue thanks to the 2012 presidential election and the holiday season to help make ends meet. But if election and holiday mail don't come through, financial shortfalls could be worse, the inspector general warns. The Postal Service has a back-up plan to conserve cash so it'll be able to deliver mail on time and keep the lights on at post offices. It would skip paying into the federal retirement system and would skimp on workers compensation payments due to the Department of Labor. Stiffing the retirement system wouldn't be so bad, since the Postal Service has overpaid that program to the tune of $11.4 billion. Both bills in Congress would allow the service to recoup that money in order to pay off other debts, including a $12.7 billion loan from Treasury. But short-changing the workers' compensation payments could have consequences, the inspector general warned. The Department of Labor may not have enough in reserve for its program, which compensates federal employees who have been injured on the job. Postal Service Chief Financial Officer Stephen J. Masse said officials hadn't made a decision about whether to take any "extraordinary cash preservation measures" and would monitor the cash situation. Postal watchers expect the House to take up a bill authored by Rep. Darrell Issa, a California Republican, after Nov. 6. If the bill passes, then the two chambers would meet to resolve differences between the bills. "They're not going to be doing anything other than posturing before the election," said Anthony Conway, executive director of the Alliance of Nonprofit Mailers. "While I think Issa has the votes, it's a tough vote to take right before the election." Conway says he expects Congress will eventually step up and rescue the Postal Service before the agency is forced to contemplate the kind of insolvency that would prevent workers from being paid.